Sparkman and Stephens Tomahawk isdesign number 226 and built in 1938 by Karl E. Kistler & Barrett Boat Works of Spring Lake, Michigan. She was brought back to the UK by the owner of Ocean Yacht Company Brian Pope, where down in Cornwall she underwent a full rebuild in 2002. Having competed very successfully in many different regattas, winning Third in Class in Antigua, the Concours de Elegance & the Woodstock Tropp for the Best Restored Yacht in the regatta 2007. With a all up weight at a little over 10 tons, she is very well suited to compete under CIM & IRC, but also able to cruise for long distances. 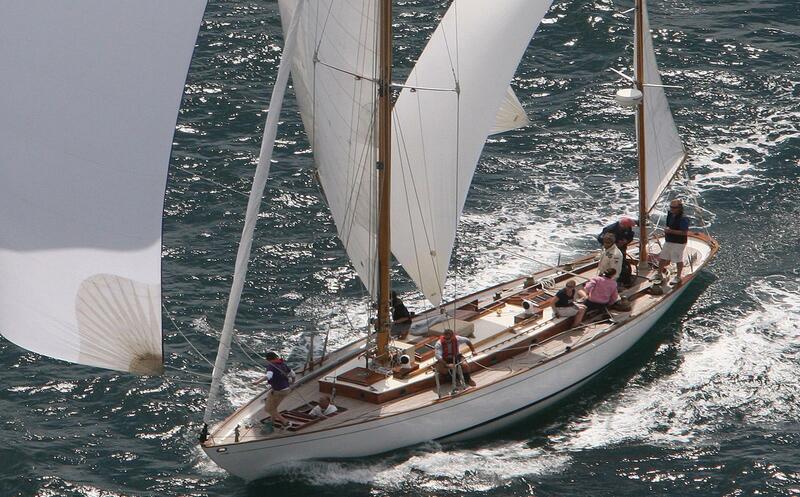 During the Pendennis Cup in the UK she famously broke her main mast twice in the same regatta. Having lost the top in an early race the men at Mylor repaired and re-stepped it overnight using the advantage of a lay-day, only for it to break again later in the series. Having shipped the remains of it back to Collars the new mainmast was constructed in best quality Sitka Spruce, adding a little more section to assist in some additional strength where required. All the original fittings were re-used and the new mast was stepped in time for the following season. The boom was also replaced and stiffened accordingly using all the original fittings for authenticity. Heading down to the Med to race under CIM a new wooden spinnaker pole was added for the 2013 season.